In this article I’ll introduce the concept of Streaming MapReduce processing using GridGain and Scala. The choice of Scala is simply due to the fact that it provides for very concise notation and GridGain provides very effective DSL for Scala. Rest assured you can equally follow this post in Java or Groovy just as well. The concept of streaming processing (and Streaming MapReduce in particular) can be basically defined as continues distributed processing of continuously incoming data streams. The obvious difference between other forms of distributed processing is that input data cannot be fully sized (or known) before the processing starts, and the incoming data appears to be “endless” from the point of view of the processing application. Typical examples of streaming processing would be processing incoming web event-level logs, twitter firehose, trade-level information in financial systems, facebook updates, RFID chips updates, etc. Another interesting observation is that streaming processing is almost always real time. The important point here is that streaming nature of input data necessitates the real time characteristic of processing. If your processing lags behind the volume of incoming live data – you will inevitably run out of space to buffer the incoming data and system will crash. First is a very simply canonical MapReduce application that I’ll use to illustrate the basics of GridGain. Second is a bit more involved and will demonstrate how you can write a start-to-end streaming MapReduce application (from ingestion to querying). Let’s start with GridGain. GridGain is Java-based middleware for in-memory processing of big data in a distributed environment. It is based on high performance in-memory data platform that integrates world’s fastest MapReduce implementation with In-Memory Data Grid technology delivering easy to use and easy to scale software. For the first example we’ll develop an application that will take the string as an argument and will calculate number of non-space characters in it. It will accomplish it by splitting the argument string into individual words, and calculating the number of characters in each word on remote nodes that are currently available in the grid. In the end – it will aggregate the lengths of all words into the final result. This is a standard “HelloWorld” example in the word of distributed programming. Note that you can start as many local nodes as you need – just run this script as many times. Note also that you can start standalone nodes from Visor – GridGain DevOps Console (discussion on that is outside of this blog). Once you started all the nodes (let’s say 2) you’ll notice that all nodes started and discovered each other automatically with no drama. You have exactly zero configuration to worry about and everything works completely out-of-the-box. Depending on what build system you use (SBT, Ant, IDEA, Eclipse, etc.) you just need to include the libs from GridGain (main JAR + JARs in '/libs' subfolder) – and compile. First we use scalar “keyword” passing it a path to configuration XML file to startup a node from within our Scala app. grid$ denotes a global projection on all node in the cluster (GridGain employes functional API in its core). Projection provides a monadic set of operations available on any arbitraty set of GridGain nodes. reduction function that will be used to aggregate the remote results. When spreadReduce(...) completes (and it’s a synch call among synch and async options) – it returns the non-space count of characters. Now – let me ask you a question… Did you notice any deployment steps, any Ant, Maven, any copying of JAR or any redeploying after we’ve changed the code? The answer is no. GridGain provides pretty unique zero deployment technology that allows for complete on-demand class deployment throughout the cluster – leaving you the developer to simply write the code and run your applications as you would do locally. Pretty nifty, isn’t it? Ok, now that we tried something very simple and trivial let’s develop a full featured streaming MapReduce app using what we’ve learned so far. We’ll adopt a canonical example from Hadoop: we’ll ingest number of books into in-memory data grid, and will find 10 most frequent words from those books. 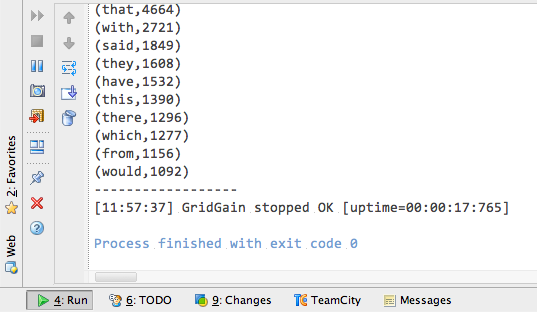 while we are loading books into memory we will be continuously querying the data grid for 10 most frequent words. As data gets loaded the results will change, and when all books are fully loaded we’ll get our correct (and final) tally of 10 most frequent words. // Populate cache & force one more run to get the final counts. // populating cache with words and their counts. pool.submit(() => Source.fromFile(new File(dir, book), "ISO-8859-1"). ldr.close(false) // Wait for data loader to complete. "length(_key) > 3 order by _val desc limit " + cnt). In about 50 lines of code we’ve put together both ingestion and querying streaming MapReduce app. We’ve run it on the local cluster – and it will run just the same way on 3, 10, 100s or 1000s of nodes deployed anywhere in the world (as long as we have some way to connect to them). Keep in mind that this is obviously a very simply (almost trivialized) example of streaming MapReduce. Yet with additional few lines of code you can replace book with, let’s say, Twitter firehose keyed by hashtags, and print outs with updates to your social dashboard – and you get a pretty useful system tracking most popular Twitter hashtags in real time in a few hundred lines of code – while automatically scaling to 100s terabytes of data being processed on 1000s of nodes.